We are looking forward to seeing you on the campus of Roanoke College this Friday and Saturday–March 23-24! If you have not already registered, you can do so here. 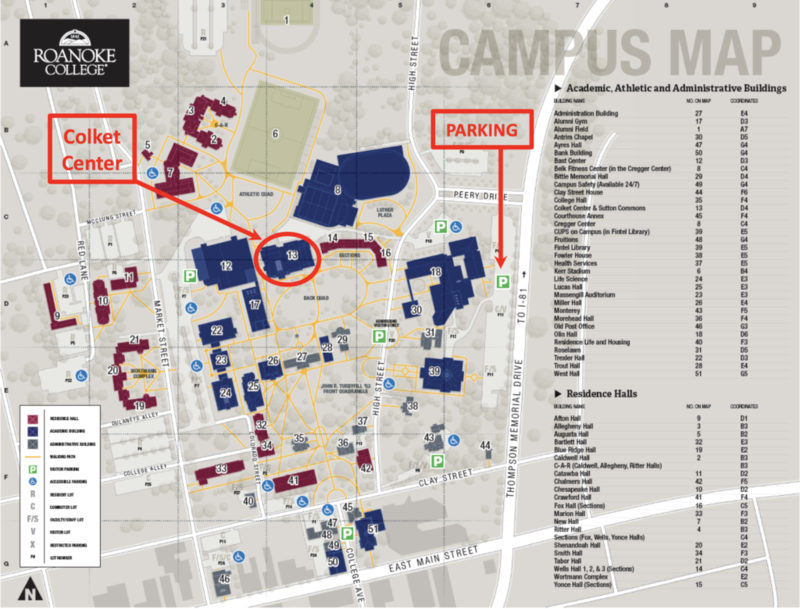 The 2018 VHC program is now available, as is a map of the campus. Please feel free to contact Marwood Larson-Harris if you have any additional questions. 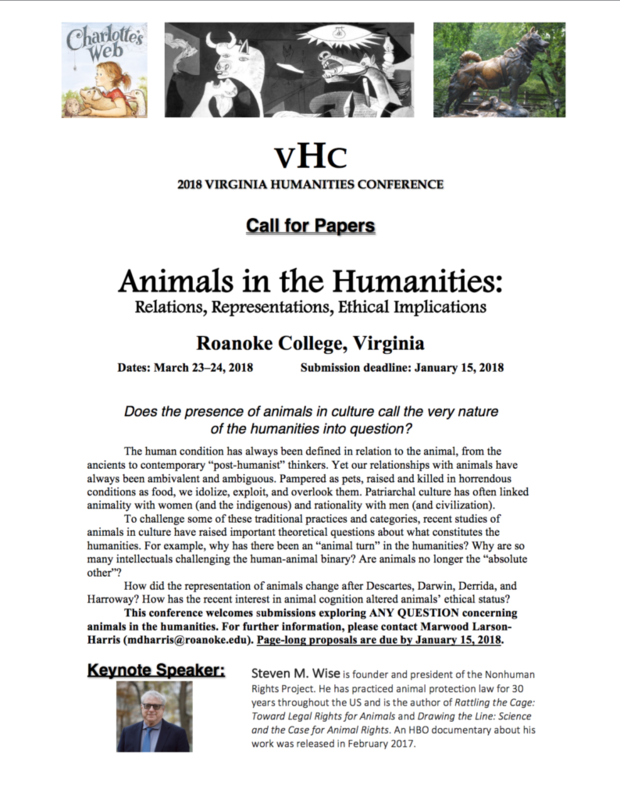 The deadline for panel and paper proposals for the 2018 Virginia Humanities Conference, on “Animals in the Humanities”–with keynote speaker Stephen M. Wise–has been extended to February 15. Please send 250-word proposals to the conference chair, Marwood Larson-Harris, at mdharris@roanoke.edu, or use the online form, here. Read the complete CFP here. We hope to see you in Roanoke at the end of March! Does the presence of animals in culture call the very nature of the humanities into question? The human condition has always been defined in relation to the animal, from the ancients to contemporary “post-humanist” thinkers. Yet our relationships with animals have always been ambivalent and ambiguous. Pampered as pets, raised and killed in horrendous conditions as food, we idolize, exploit, and overlook them. Patriarchal culture has often linked animality with women (and the indigenous) and rationality with men (and civilization). To challenge some of these traditional practices and categories, recent studies of animals in culture have raised important theoretical questions about what constitutes the humanities. For example, why has there been an “animal turn” in the humanities? Why are so many intellectuals challenging the human-animal binary? Are animals no longer the “absolute other”? How did the representation of animals change after Descartes, Darwin, Derrida, and Harroway? How has the recent interest in animal cognition altered animals’ ethical status? This conference welcomes submissions exploring ANY QUESTION concerning animals in the humanities. For further information, please contact Marwood LarsonHarris (mdharris@roanoke.edu). Page-long proposals are due by January 15, 2018. Keynote Speaker: Steven M. Wise is founder and president of the Nonhuman Rights Project. He has practiced animal protection law for 30 years throughout the US and is the author of Rattling the Cage: Toward Legal Rights for Animals and Drawing the Line: Science and the Case for Animal Rights. An HBO documentary about his work was released in February 2017.